building solutions in store for you! Today’s lifestyles are getting busier and busier. Hobbies and recreational activities are more important for the busy individual. More and more, people are looking to K-Van Construction to provide “lifestyle” storage solutions. Whether you need a safe, dry place for your boat, ATV or snowmobiles or a handy hobby shop, we can provide an attractive, cost-effective building to meet your specific needs. One of our pre-engineered wood-frame structures will offer you faster speed of completion, greater energy efficiency and strength, and you best value in total open space. In order to reflect your own personal taste, we offer a large list of optional accessories to spruce up your structure, from weather vanes to doors, windows and trim options. 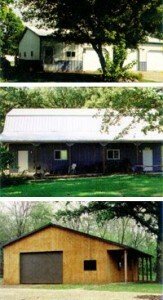 So tell us about your storage or utility building needs. We’ll listen carefully and come up with a solution that best fits those needs! © Copyright 2015, K-Van Construction, Iowa Falls, IA.